Do you know Google is providing an awesome feature, that you can create a totally customizable personalized Google Maps for your website based on theme colors. Today I want to explain how to customize and style Google Map from the scratch, just very few lines of code, this helps you to enrich your website design. 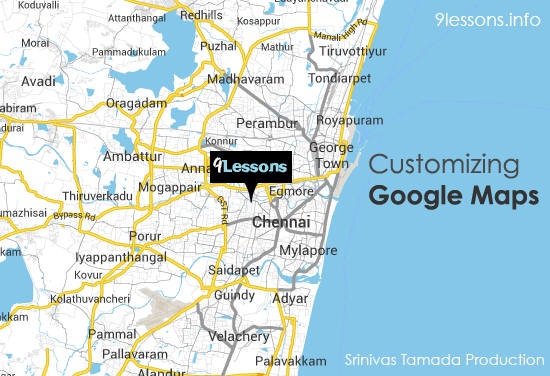 Create Google map styles using Styled Maps Wizard. Indeed it is great. I tried this few times but failed. Thanks. Grt. Do we need to have an API key and secret ID if we want to use this in our classified portal for our users and advertisers? As I am seeing you have not used that. So what is your say on this? There is no zoom in and zoom out functionality.....otherwise it is perfect!!! Which wireframing tool you used wireframig. excelent, good explanation, thanks men. Não consegui acessar o 'Download Script', o link está quebrado! Unable to access the 'Download Script', the link is broken! 'डाउनलोड स्क्रिप्ट' का उपयोग करने में असमर्थ, लिंक टूट गया है! please give an example using php mysql and google map. very well posted. thanks. will try though it seems a bit tough for me. Excellent tutorial Srinivas . I tried to implement this tutorial and it worked liked a charm . Thanks for sharing the codes with us . using this code i changed Latitude and Longitude but no result shown what i need to do ? Can you show how to make map responsive ? this is really helpful one...!! Very useful , can you show how to add 2 or more markers(locations) ? Great post so useful article thank you sir. Great Post! Very helpful! But i have one question: how do I add another maker? Would be great if you could publish a solution.